Texas officials flagged 95,000 voters for citizenship reviews. But after thousands have already been cleared, questions are being raised about how they handled the process. State Rep. Rafael Anchia had been alarmed by the actions of the Texas secretary of state’s office for days by the time the agency’s chief, David Whitley, walked into the Dallas Democrat’s Capitol office Monday. The Friday before, Whitley’s staff had issued a bombshell press release calling into question the citizenship of 95,000 registered voters in Texas. Soon after, Democratic lawmakers and advocacy groups were raising serious questions about how many people on that list were actually noncitizens who are ineligible to vote. But before those doubts emerged, Whitley, the top election officer in the state, had handed over information about those registered voters to the Texas attorney general, which has the jurisdiction to prosecute them for felony crimes. So as Anchia sat at the end of his green, glass-topped conference table, he wanted to know: Did Whitley know for sure that any of the names on his list had committed crimes by voting as noncitizens? “No,” Whitley answered, according to Anchia. “I do not have an answer for that,” Whitley responded, according to Anchia’s recollection of the Monday meeting. By then, Whitley’s press release had already been signal-boosted by top Republican officials — including President Donald Trump — who slapped on unsubstantiated claims of voter fraud and illegal voter registration and pointed to it as proof that voter rolls needed to be purged. And county election officials across the state had gone to work parsing through the records of thousands of registered voters whose citizenship status the state said they should consider verifying. Some counties were even in the process of sending letters to voters ordering them to prove they were citizens. Soon after, the citizenship review effort buckled, revealing itself as a ham-handed exercise that threatened to jeopardize the votes of thousands of legitimate voters across the state. The secretary of state’s office eventually walked back its initial findings after embarrassing errors in the data revealed that tens of thousands of the voters the state flagged were citizens. At least one lawsuit was filed to halt the review, and others were likely in the pipeline. And a week into the review, no evidence of large-scale voter fraud had emerged. But at their Monday meeting, Whitley argued that his office was following the normal course of upkeep of the voter rolls. That didn’t make Anchia — who chairs the Texas House’s Mexican American Legislative Caucus — feel much better. The citizenship check effort went public this week, but the seeds for it were planted in 2013. That year, Texas lawmakers quietly passed a law granting the secretary of state’s office access to personal information maintained by the Department of Public Safety. During legislative hearings at the time, Keith Ingram, director of elections for the secretary of state’s office, told lawmakers that the information would help his office verify the voter rolls. The state had had a recent misstep when it tried to remove dead people from the rolls and ended up sending “potential deceased” notices to Texans who were still alive. One of the DPS records the secretary of state's office was granted access to under the 2013 law was a list of people who had turned in documentation — such as a green card or a work visa — that indicated they weren’t citizens when they obtained a driver’s license or a state ID card. But it appears that the secretary of state’s office held off for years before comparing that list with its list of registered voters. Former Secretary of State Carlos Cascos, a self-proclaimed skeptic of Republican claims of rampant voter fraud, said he had no memory of even considering using the DPS data when he served from 2015-17. And there was reason to be careful with the “lawful presence list.” Driver’s licenses don’t have to be renewed for several years. In between renewals, Texans aren’t required to notify DPS about changes in citizenship status. That means many of the people on the list could have become citizens and registered to vote without DPS knowing. Other states learned the hard way that basing similar checks on driver’s license data was risky. In 2012, Florida officials drew up a list of about 180,000 possible noncitizens. It was later culled to about 2,600 names, but even then that data was found to include errors. Ultimately, only about 85 voters were nixed from the rolls. Around the same time, officials in Colorado started with a list of 11,805 individuals on the voter rolls who they said were noncitizens when they got their driver’s licenses. In the end, state officials said they had found about 141 noncitizens on the rolls — 35 of whom had a voting history — but that those still needed to be verified by local election officials. It was under the helm of former Secretary of State Rolando Pablos, who took over in 2017, that Texas began processing the DPS list. That happened even though at least some people in the office knew the risk. Officials in the secretary of state’s office early last year told The Texas Tribune that similar checks in other states using driver’s license data had run into issues with naturalized citizens. Pablos didn’t respond to requests for comment. Still, on Dec. 5, Betsy Schonhoff, voter registration manager for the secretary of state’s office, told local officials that her office had been working with DPS “this past year” to “evaluate information regarding individuals identified by DPS to not be citizens.” In a mass email sent to Texas counties — and obtained by the Tribune — Schonhoff informed them that the secretary of state’s office would be obtaining additional information from DPS in monthly files and sending out lists of matches starting in mid-January. The next day, Pablos announced he would resign after two years in office. In his place, Republican Gov. Greg Abbott appointed Whitley, a longtime Abbott aide who at the time served as the governor’s deputy chief of staff. Last Friday, Williamson County Elections Administrator Chris Davis had just wrapped up a staff retreat when he got back to his office in Georgetown. By then, news of the state’s list of 95,000 registered voters flagged for review was spreading. A secretary of state’s advisory about the list had landed in his inbox earlier that day, but it didn’t include any numbers. He knew the reported total of 95,000 likely included naturalized citizens from the get-go. But misinformation spread quickly. Some of the statements released about the list were misleading. Others were downright inaccurate. Texas Attorney General Ken Paxton, a Republican, took to Twitter within the hour and prefaced the news with the words “VOTER FRAUD ALERT.” At that point, none of the counties had any data to verify. The next day, the president chimed in, claiming on Twitter that “58,000 non-citizens voted in Texas” and adding the unsupported claim that “voter fraud is rampant” across the country. But when El Paso County’s election administrator, Lisa Wise, examined the list of 4,152 names she got from the state Monday morning, she knew something was wrong. Included on the list was one of her staff members — a naturalized citizen since 2017. The errors didn’t end there. By Tuesday morning, secretary of state officials had started calling counties across the state to inform them that they had made a mistake. The office had incorrectly included some voters who had submitted their voting registration applications at DPS offices and had been confirmed to be citizens since then, county officials said. Things grew even more confusing for Remi Garza, elections administrator in Cameron County. He had originally received a list with just more than 1,600 people to review. When someone from the secretary of state’s office called Tuesday, Garza was told that weeding out applications labeled as “source code 64” — the code that indicates the origin of the application was a DPS office — would remove “well over” 1,500 names from his list, leaving him with just 30 individuals to investigate. But his staff was only able to find 300 people whose applications were labeled as such, Garza said. After another call with the secretary of state’s office, Garza said he was told that the 1,500 number had also been incorrect. Now, he said, he’s left with about 85 percent of his list. After the secretary of state’s calls, the number of registered voters flagged by the state began to plummet. In Harris County alone, the state’s flub translated to about 18,000 voters — about 60 percent of the original list — whose citizenship status shouldn’t have been questioned. In Travis County, officials dropped 634 voters off their original list of 4,558. Dallas County’s original list of 9,938 dropped by more than 1,700 voters. In Tarrant County, about 1,100 voters were cleared from the original 5,800. 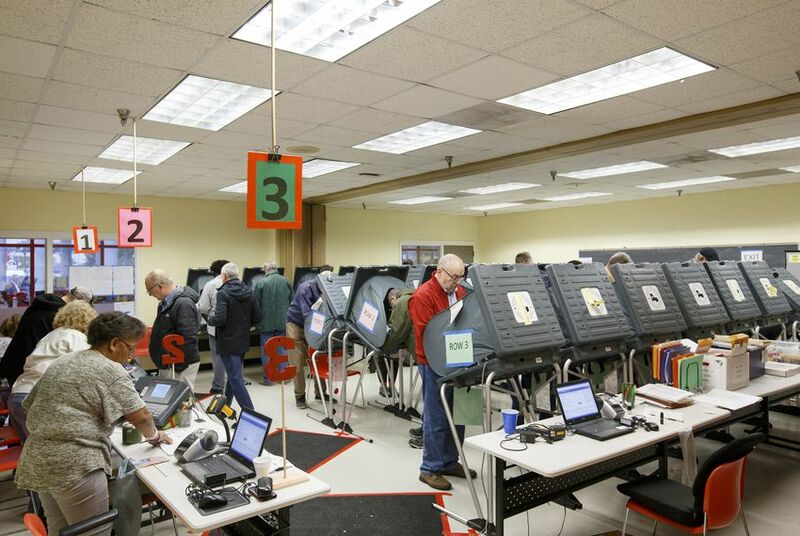 The secretary of state’s office told the McLennan County elections office to disregard its entire list of 366 voters, the Waco-Tribune Herald reported. But the state’s calls came a day too late in Galveston County, where Cheryl Johnson, who oversees the voter rolls as the county’s tax assessor-collector, had already sent off the first batch of “proof of citizenship” letters to voters who were on her initial list of more than 830 people. On Monday, her office had mailed 92 notices that told voters their registration would be canceled if they didn’t prove their citizenship within 30 days. That warning applied to citizens who missed the notice in the mail or didn’t gather their documentation in time. On Tuesday, Johnson learned from the state that 62 of those letters never should have been sent out. She spent Wednesday preparing follow-up letters to inform those voters that their registration was safe. When she finally took her oath of citizenship in a federal building in San Antonio last April, she let only two days go by before registering to vote in Austin, her adopted hometown. She excitedly cast a ballot in November. But she’s been stewing since last Friday when she heard about the secretary of state’s announcement. Garibay last renewed her driver’s license in 2017 — before she became a U.S. citizen — so she was sure she was on the list. A Travis County official called her to confirm her suspicions Wednesday, after Garibay reached out. Travis County election officials suspected people like Garibay would be on their list. And state officials confirmed to them Tuesday that the records they provided might include voters who were not citizens when they applied for a driver’s license but had since become naturalized citizens, said Bruce Elfant, the county’s tax assessor-collector and voter registrar. But the secretary of state’s office has not confirmed that publicly, and it has not responded to questions about whether it will send updates to the attorney general’s office to clear individuals who were on the original list. Amid the silence, civil rights groups and members of the Mexican American Legislative Caucus have raised questions about whether the secretary of state’s office publicized its numbers knowing naturalized citizens would be included — or worse, that it published them because naturalized citizens could be purged from the rolls in the process. For Cascos, a Republican who said he long struggled to toe the party line when it came supporting claims that voter fraud was “rampant,” it’s been problematic to watch how the secretary of state’s initial announcement seemed to confirm the beliefs of many Republicans. “I think there’s a problem here, and the problem is that, in my opinion, someone did not do their due diligence before they let these numbers out,” Cascos said. On Thursday, Abbott — whose initial reaction to the numbers went as far as vowing a legislative fix — attempted to recast the secretary of state’s announcement as a work in progress. "They were reaching out to counties saying, ‘Listen, this isn’t a hard-and-fast list," Abbott said at an unrelated press conference. "This is a list that we need to work on together to make sure that those who do not have the legal authority to vote are not going to be able to vote." But while some election officials are looking for ways to clear naturalized citizens without asking them to verify their citizenship, others are unlikely to follow suit. For instance, Johnson in Galveston County says she has no way to determine whether the people on her list are citizens other than sending them notices that start the 30-day clock for them to provide proof to avoid getting kicked off the rolls. Secretary of state officials, in conversations with county officials, have gone so far as to express interest in how locals were identifying naturalized citizens on the list. On Tuesday, the civil rights group League of United Latin American Citizens filed a lawsuit that argued that forcing naturalized citizens to prove they are legitimate voters amounts to a “witch hunt” and a “plan carefully calibrated to intimidate legitimate registered voters from continuing to participate in the election process." But Garibay, the Mexican immigrant, sums it up as irresponsible and frustrating.